Alan Pardew on lack of experienced players | NUFC Blog. Archive for tag: Alan Pardew on lack of experienced players. 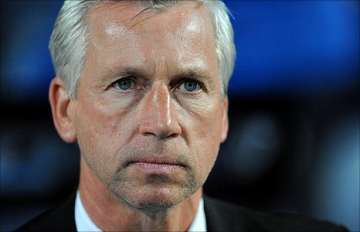 Pardew missed experience of Nolan and Barton in Wolves game. Pardew: Missing the old codgers in midfield? Speaking in a rare interview, Newcastle United manager, Alan Pardew, bemoaned the loss of experienced players such as Kevin Nolan and Joey Barton from the side in games like yesterday’s against Wolves. He also added that Newcastle United still need to learn to see out games. Of course, Newcastle chalked up their fourth win of the Premiership season against Wolves, though they took something of a battering in the latter stages of the game, and were undoubtedly helped by a couple of incorrect decisions by the referee, Mark Halsey and his linesman. The first was a free kick which should have been a penalty for a Steven Taylor foul which took place a yard inside the area, and the second being a perfectly good goal which was ruled out by the linesman. Pardew acknowledged the luck in his post match interviews, and also gave credit to the performance of Mick McCarthy’s Midlands men.